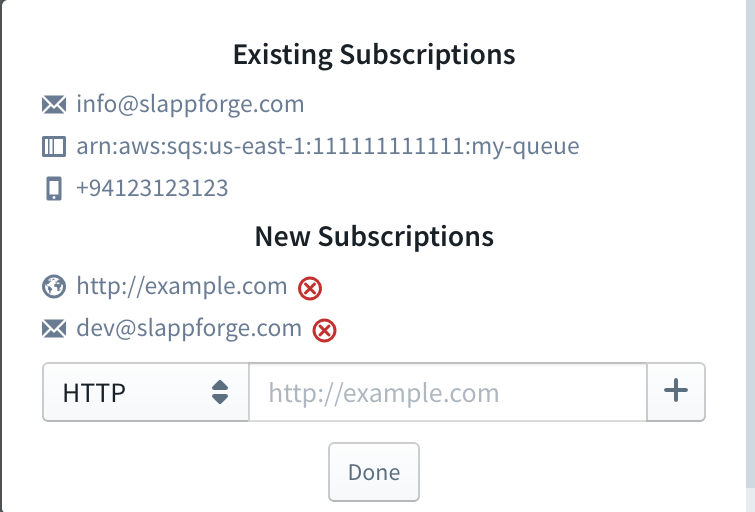 Amazon Simple Notification Service (SNS) is a flexible, fully managed pub-sub messaging and mobile notifications service for coordinating the delivery of messages to subscribing endpoints and clients. With SNS you can fan-out messages to a large number of subscribers, including distributed systems and services, and mobile devices. The Sigma IDE currently supports the following 3 types of SNS resources. A SNS topic can be used as a trigger for a lambda function within Sigma. For that, a SNS resource should be dragged from the resources panel and dropped on top of the event parameter of the lambda handler. 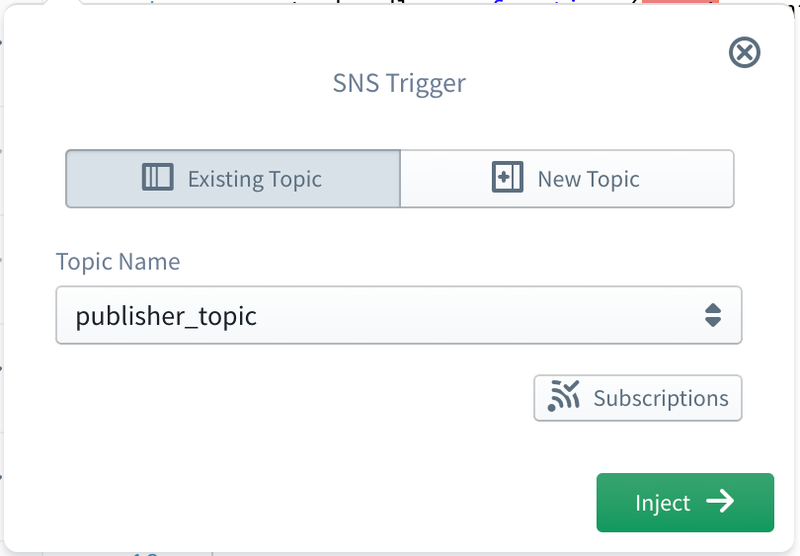 Then the SNS topic configuration panel can be used to set a SNS topic as the trigger. When a SNS topic is configured as a trigger to a Lambda function, that function is invoked each time a message is published to the topic. The structure of trigger event received by Lambda function is of the following format. SNS triggers do not have any trigger specific parameters. In SNS topic configuration panel, it is possible either to select an existing SNS topic or to define a new SNS topic. To select an existing topic, first go to the Existing Topic tab of the configuration panel. Then the Topic Name drop-down will be populated with all the already defined SNS topics in your AWS account for the current project region. You can simply select the required topic from that list. To define a new topic, first go to the New Topic tab of the configuration panel. Then a Topic Name should be provided, and this topic name must be non-empty and should contain only alphanumeric characters, hyphens (-), or underscores (_). Then a Display Name also should be provided and it should less than 10 characters in length. Sigma also provides the facility to add new subscriptions to an existing or a newly defined topic. For that, first click on the Subscriptions button below the topic configuration fields, which will open the subscriptions panel of the topic. If you are using an existing topic which already has any subscriptions, they will be shown under Existing Subscriptions, and they cannot be changed. The new subscriptions you have defined through Sigma will be shown under New Subscriptions and any one of them can be removed by clicking on the remove button in-front. To add a new subscription, first a subscription protocol should be selected from the drop-down on the left and then a suitable subscription endpoint should be specified in the right text box. Currently the following types of subscription protocols are supported. Once the subscription protocol and endpoint are defined, click the + button to add the subscription. Although only the SNS topic resources can be used as triggers, all 3 types of SNS resources can be used inside Lambda code as operations. For that, a SNS resource should be dragged from the resources panel and dropped on the required line of the lambda code editor. Then the required Resource Type should be selected from the SNS resource configuration panel. When Topic is selected as the resource type, first an existing topic should be selected or a new topic should be defined for the operations. This procedure is exactly similar to setting a SNS topic when a SNS trigger is defined. Once the topic is configured, an operation to be injected can be selected from the Operation drop-down. Currently Sigma supports the following operations on SNS topics. Publish Message operation can be used to programmatically publish a message to a SNS topic. Following are the fields related to this operation. Message Attributes A set of key-value pairs that should be set as message attributes. The type of the value can be String, String Array, Number or Binary. Get Topic Attributes operation can be used to programmatically retrieve the current attributes set for a SNS topic. This operation does not require any operation level parameters. List Topic Subscriptions operation can be used to programmatically retrieve the list of current subscriptions of a SNS topic. This operation does not require any operation level parameters. Set Topic Attribute operation can be used to programmatically set the value of a SNS topic attribute. Following are the fields related to this operation. 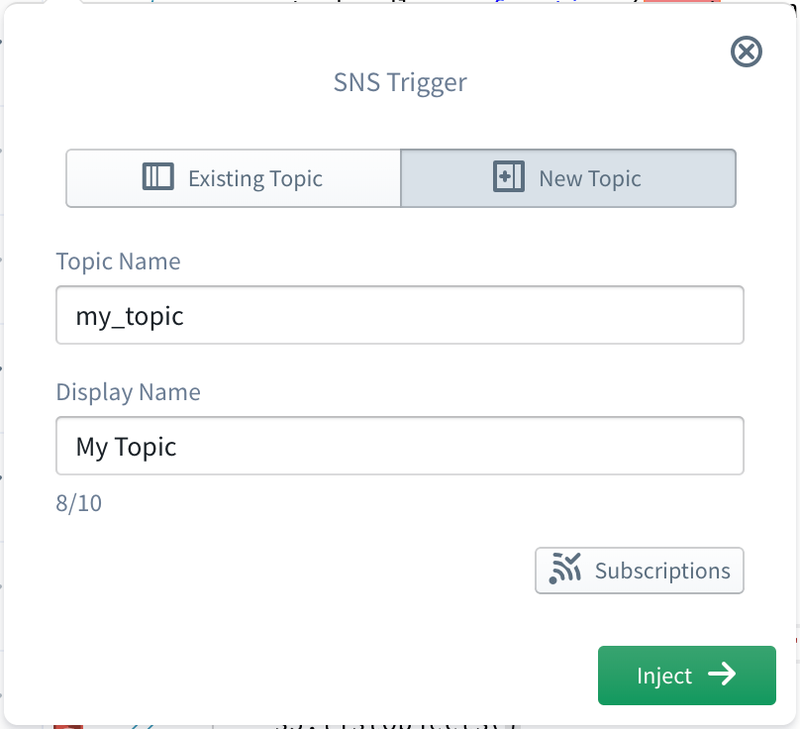 Add Topic Subscription operation can be used to programmatically add a new subscription to a SNS topic. Following are the fields related to this operation. Subscription Protocol Protocol of the subscription to be added. This can be HTTP, HTTPS, Email, Email JSON, SQS, Application, Lambda or SMS. Please refer Adding subscriptions to a topic section for more details on subscription protocols and related endpoints. Confirm Topic Subscription operation can be used to programmatically confirm a subscription for a SNS topic. Following are the fields related to this operation. Remove Topic Subscription operation can be used to programmatically remove an existing subscription from a SNS topic. Following are the fields related to this operation. SNS Direct SMS resource can be used to send text messages directly to a phone number via SNS, without having to subscribe to a topic. Following are the fields related to this operation. Message The message to be sent. If the message is longer than 160 characters, it will be treated as multiple text messages. Message Type The type of the message, which can be either Promotional or Transactional. Promotional type can be used for non-critical messages, such as marketing messages, where SNS optimizes the message delivery to incur the lowest cost. Transactional type can be used for critical messages that support customer transactions, such as one-time passcodes for multi-factor authentication, where SNS optimizes the message delivery to achieve the highest reliability. Sender ID The sender ID to be displayed as the message sender on the receiving device. This can contain up to 11 alphanumeric characters, including at least one letter and no spaces. 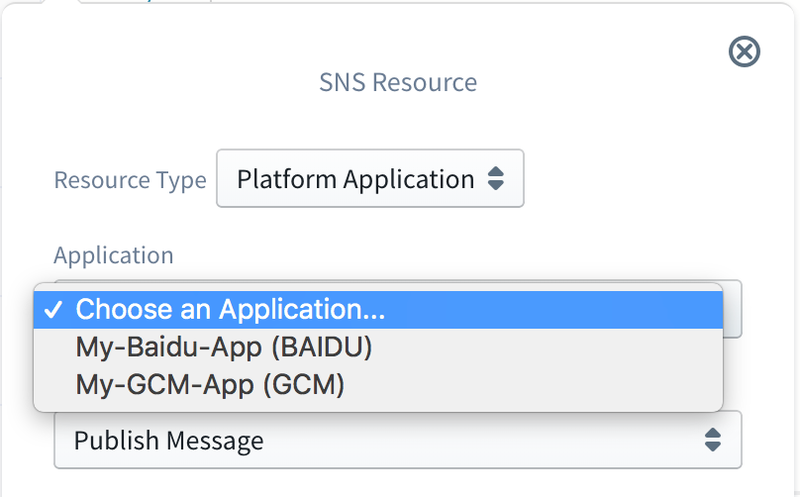 SNS Platform Application resource can be used to send notification messages to mobile apps and devices. Currently Sigma only supports operations on existing Platform Applications. When Platform Application is selected as the resource type, first an existing platform application should be selected from the Application drop-down for the operations. Once the application is selected, an operation to be injected can be selected from the Operation drop-down. Currently Sigma supports the following operations on SNS Platform Applications. Publish Message operation can be used to programmatically publish a message to a platform application endpoint. Following are the fields related to this operation. Create Endpoint operation can be used to programmatically add a new endpoint to a platform application. Following are the fields related to this operation. Token Unique identifier created by the notification service for an app on a device. The specific name for Token will vary, depending on which notification service is being used. ADM, the device token equivalent is called the registration ID. Delete Endpoint operation can be used to programmatically remove an existing endpoint from a platform application. Following are the fields related to this operation.